The World Cup continues to dominate Twitter. 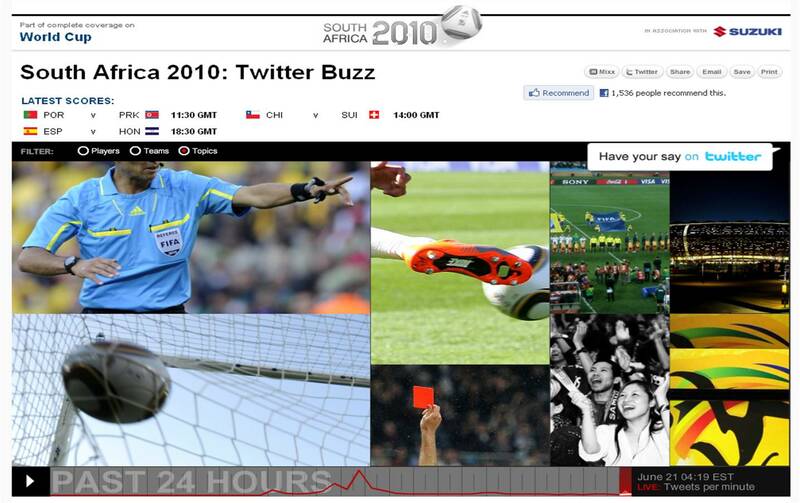 The official Twitter World Cup pages at http://twitter.com/worldcup are interesting, but the best visualisation I have seen yet is at CNN. 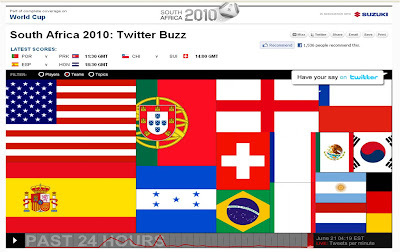 The CNN World Cup Twitter Buzz page presents a pictorial mashup of the top 10 World Cup trending topics on Twitter. The pictures change in real-time and users have 3 options for viewing - either able to look at Trends associated to players, teams or topics. 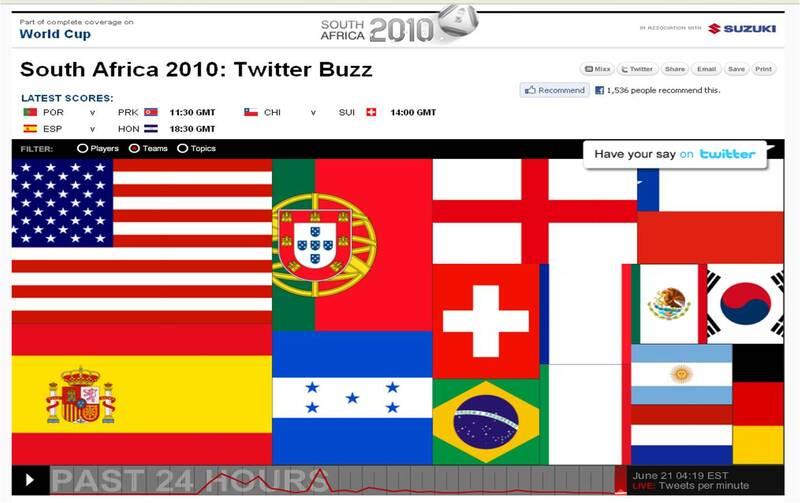 The CNN World Cup Twitter visualisation also offers the chance to 'play' through the last 24 hours so users can see how World Cup Twitter trends have changed / moved around over the last day. 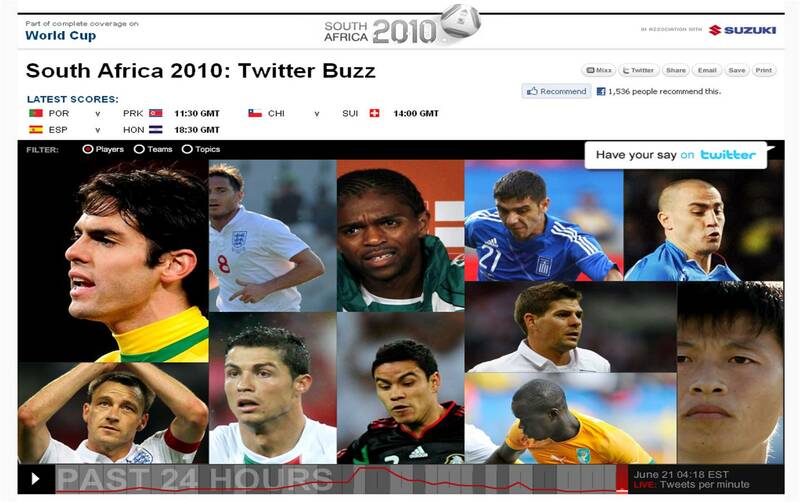 World Cup tweets from CNN reporters are then aggregated in a list below the World Cup Trend visualisation. 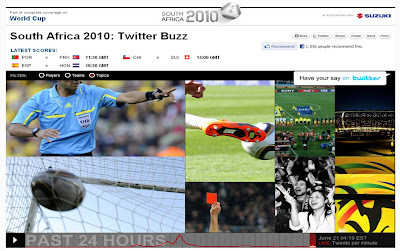 All sponsored by Suzuki, this is 'part of' CNN's 'complete' World Cup coverage and a really nice example of how publicly available (Twitter) data can be turned into something relevant and useful for readers. The World Cup in 3D!